The European Space Agency announced Wednesday it will launch a robotic mission in 2022 on a tour of Jupiter's icy moons to examine the subsurface oceans and frozen crusts of Ganymede, Callisto and Europa. 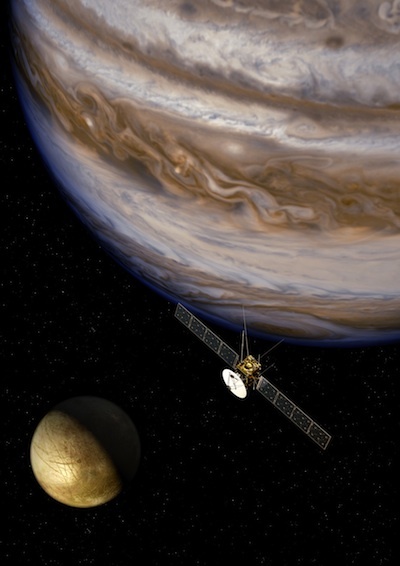 Known as JUICE, the Jupiter Icy Moons Explorer, the probe will enter orbit around the gas giant planet in 2030 for a series of flybys of Ganymede, Callisto and Europa. 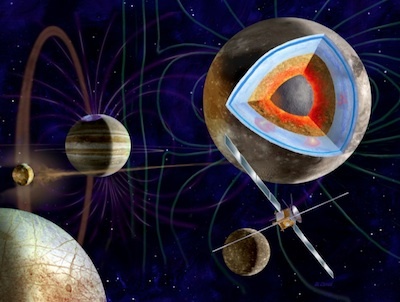 JUICE will brake into orbit around Ganymede, Jupiter's largest moon, in 2032 for at least one year of close-up research. ESA's science program committee adopted the recommendation of the agency's space science advisors during a meeting Wednesday. JUICE will blast off on an Ariane 5 rocket in June 2022. "Jupiter is the archetype for the giant planets of the solar system and for many giant planets being found around other stars," said Alvaro Gimenez Canete, ESA's director of science and robotic exploration. "JUICE will give us better insight into how gas giants and their orbiting worlds form, and their potential for hosting life." JUICE's selection beat out proposals for an X-ray astrophysics observatory and a gravitational wave detector mission to become ESA's first large-class mission in the Cosmic Vision program, which is selecting a portfolio of space science probes for launch in the next decade. "It was a difficult decision to choose one mission from three excellent candidates," said Gimenez Canete. "All three would produce world-class science and put Europe at the forefront of space research. JUICE is a necessary step for the future exploration of our outer solar system." JUICE will be the first European-led mission to the outer planets. Originally envisioned as one-half of a two-spacecraft mission to Jupiter with NASA, ESA redesigned its orbiter in 2011 after the U.S. space agency withdrew from the project. NASA's contribution was planned to be an orbiter around Europa, but the agency informed ESA last year it could not afford to build and launch the spacecraft. NASA also told ESA it would be unable to participate in ATHENA and NGO - the X-ray telescope and gravitational wave observatory competing against the Jupiter mission. European officials reassessed the three finalists for the first "L-class" mission, writing NASA out of the proposals to make ESA responsible for all major components. The ATHENA and NGO missions grew more complex and costly for Europe, which would have had to take on more development expenses after NASA's exit. At 830 million euros, or about $1.1 billion, JUICE ended up as the least expensive of the L-class proposals, and scientists regained some of the lost science at Europa with two flybys soon after the spacecraft arrives at Jupiter. The spacecraft's ice-penetrating radar should make the first precise measurements of the thickness of Europa's global ice sheet, which scientists believe covers a salt water ocean tens of miles underneath. JUICE will also search for candidate sites for a future lander, study the composition of Europa's surface, and search for organic molecules. Many of JUICE's goals follow up on discoveries made by NASA's Galileo mission, which toured the Jupiter system from 1995 to 2003. A series of passes near Callisto, a cratered moon also suspected to harbor an underground ocean, will reveal data on its internal structure and surface features. Then JUICE will reach Ganymede in September 2032, becoming the first probe to enter orbit around a moon of Jupiter. For at least a year, the spacecraft will attempt to confirm the existence of a deep subsurface ocean on Ganymede, create a high-resolution map of its icy surface, and investigate Ganymede's magnetic field. Ganymede is the only known moon in the solar system that generates its own magnetic field.